Here's another souvenir from Portugal. 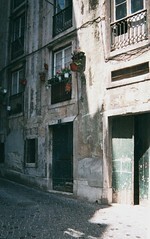 I took this picture several summers ago in the Alfama, an old and mysterious district in the hills of Lisbon. Tonight I cropped the photo just a bit, to focus on the sun and shadows hitting the building. Today at noon, we took the dogs to Lynch Park here in Beverly, Massachusetts. At first glance, Lynch Park looks like a typical city park, until you realize that it is bounded by water on three sides! 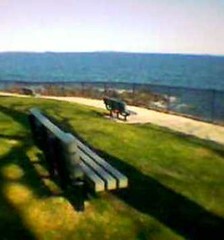 It has park benches, of course, like those you might see in any city park, except that they are placed so you can sit and watch the ocean. Although I did take a few pictures today, I prefer this one, which I took with my phonecam around this time last year. I think this picture captures the feeling of being at Lynch Park on an early spring day, before the trees leaf out. So tonight, I cropped it for the sake of the composition and here it is. Rest a minute and enjoy the view. As I was getting up this morning, I noticed how beautiful the morning light was on the tree outside my window. It is getting warmer and soon the trees will leaf out, but the bare branches have a beauty of their own. So I decided to grab my digital camera and take a few pictures, before I even had my coffee. Then I loaded the photos into the computer. 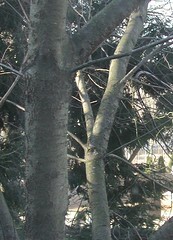 I did a little cropping to get this image, focussing on the dappled morning light on the tree. This is a photograph I took yesterday of some flowers I saw at Heather's. 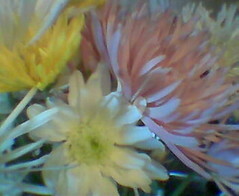 I liked the soft colors and shapes of the mums, so I used my cameraphone to take a quick picture. Here's another picture from Long Hill Gardens, where we went again today because it was warmer. I have been busy complaining about how hard it is to wait for spring, but meanwhile the flowers have been busy blooming. 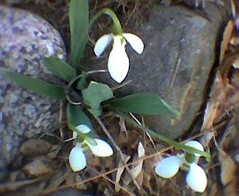 These snowdrops are scattered all over Long Hill, so I used my phone cam to take this picture. It's cold today, with a gray sky, and it feels like winter again. But just two days ago, it was warm enough to take the dogs for a walk at Long Hill Gardens, which is where I saw these crocuses. I liked the way the sunlight was hitting them, so I took a picture with my phonecam. Time for another picture of Portugal. This image began as a photo I took in Ermesinda, which is a little town in the mountains around Porto. Tonight, I did a little digital editing, and cropped the original photo to focus on the shady path, and then opened the image in Painter IX and removed some telephone wires with a bit of digital airbrush. Tonight Mel was watching a movie set in Belfast called Mickybo and Me. It looked like a great movie, so I joined him. 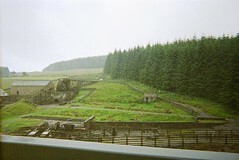 Some of the scenes were shot in towns in the Belfast area near the coast, including CarrickFergus. 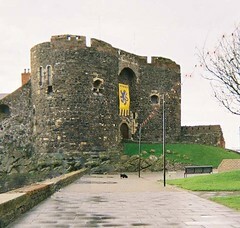 After the movie, I found a photo taken at the CarrickFergus Castle during my first trip to Belfast, but the original photo didn't have quite as clear a view of the castle because there were several tourists on the sidewalk. I opened the image in Painter IX, and with some cutting, some pasting, and some digital pastel, I managed to convince three tourists to kindly clear the sidewalk, but I decided to leave the little black dog where he was. This is a piece of digital art that I was playing around with tonight. I have been looking at mathematical graphs and illustrations, and thinking about lines and what they mean in math. For me, a line is a quick way to communicate the shape of a mountain or the gesture of the human form. To a mathematician, a line can quickly communicate a mathematical relationship -- different approaches to communicating something true about the world. Tonight I opened a file in Painter IX and began with the idea of making something that looked like a graph. I opened the pen digitizer tool and began making arcs. I can't say I had a lot of control over this tool (I almost never use it), but with trial, error, and a lot of "undo" commands, I made some shapes I liked. 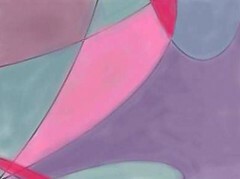 Then I decided to fill in the shapes with color, using the digital airbrush, and bringing in soft colors and blurred edges. Math and geometry shouldn't be consigned only to the textbook, the classroom, and the laboratory. Math and geometry are part of the world, and so they are part of art. While I was at the gym this morning, I looked out the window and noticed the sunlight hitting these trees. (The gym where we work out is in a beautiful wooded area.) The scene just looked so typical New England (look at that birch tree!) and typical March. So I took a picture with my phonecam. Tonight I loaded the image into the computer and cropped it for the composition. We are all waiting for spring and for the trees to leaf out and blossom. But winter has its own pleasures, one of which is being able to see the branches of the trees more clearly. This is a piece of found art, based on a photo that Mel took while he was in Korea and sent to me as a multimedia message. He sent a lot of pictures at once, and it was good to get a peek at Korea. But one of the pictures was hard to "read" and very mysterious, with strange shapes and colors. Now that Mel is back home from his latest trip (Australia), I asked him about the mystery photo and he said it is a picture of a park, and he was moving while he took the picture. I wanted a closer look at the photo, so I transferred it to my computer. The image was not salvageable as a "wish you were here" type of photo, but it had some interesting effects in it. 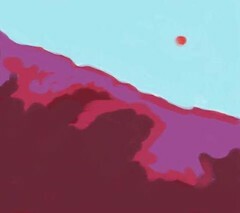 I decided to crop it and made three abstract images out of it, and this is the one I like the best. 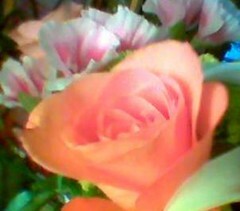 I saw this orange and pink rose in a bouquet at Heather's apartment, and the color was so unusual that I decided to take a picture with my phonecam. 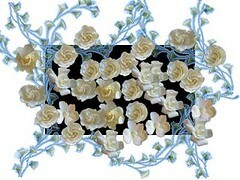 Today I edited the image, cropping the photo to concentrate attention on the rose, with the freesia in the background. 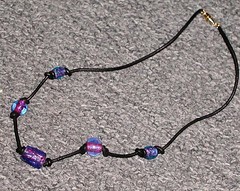 This is a necklace that I have been working on, and yesterday I finished it, and took this picture. 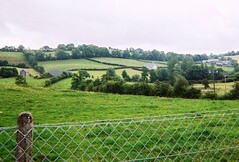 I took this picture in Ireland two summers ago as we exploring. A nice memory of Ireland! Today I ran out to the store to buy milk, just as it started to snow, undeniably and unexpectedly. But the grocery store was having a sale on daffodils, $1.88 per bunch! (Tell me, what is the value of a daffodil, and how much is too much to pay?) 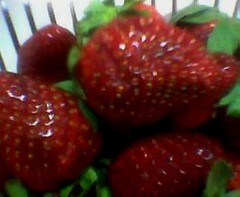 So I bought some and went home and did a photo shoot right in my kitchen, with my phonecam. Of the photos I took, this picture had the best composition and color, but there were some distracting shapes in the background, just around the edges. So I opened the image in Painter IX and cleaned up the background with some digital pastel just a bit. By now we have snow on the ground, with cold wind blowing outside. 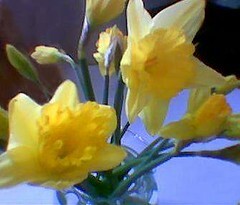 But spring is inevitable, and I have the daffodils to prove it. 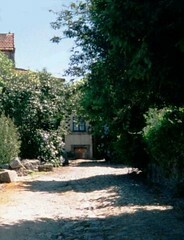 This is an image I cropped out of a photograph that I took in Cascais, Portugal in July of 2001. The sidewalks in Portugal often have patterns like this, as do the sidewalks in Brazil. I took this picture because I love the patterns, and because this reminded me of walking near the beach in Rio when Mel and I visited there in 1994. To an American eye and ear, Portugal and Brazil seem very similar at first, but of course there are many differences. (The way you say refrigerator is different in Porto and in Rio, for example, and so is the brand of soft drink you might find inside the refrigerator!) Whether I am walking in Cascais near the beach, or strolling down Avenida Atlantica in Rio, you can be sure I am looking at the sidewalks as well as at the ocean, and you can also be sure that I have a big smile on my face. 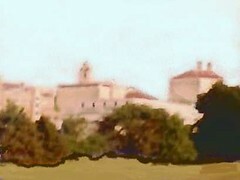 This piece of digital art is based an image cropped from the background of a photograph I took of the KU campus at Mauro's graduation in 1988. Lawrence and the University of Kansas were on CNN this morning and on my mind today because of the news about the tornado that did some damage to the campus. Many of my pictures from Lawrence, Kansas are of the wonderful people I met there, but when I looked for an photo of the campus, I found far fewer than I expected. So I decided to use this image because, for all its problems, it captured the characteristic shapes of the campus skyline. The small image that I cropped from the photo was extremely blurry, and you could hardly make out the buildings against the pale pink sky. So I opened the image in Painter IX and used the colors in the original photo to darken and sharpen the shapes of the rooflines, and changed the color of the sky to blue to add more contrast. Then I added more pastel to the foreground and even covered up the top of a football scoreboard. 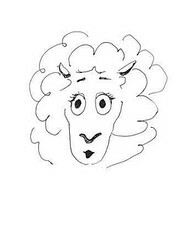 The effect is closer to a drawing than a photograph. I like the soft edges that evoke the workings of memory, even though my memories of the time I spent there are as clear and bright as crystal. 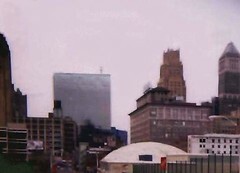 This view of the Newark skyline began as the background of a photo I took in Newark with Mel when he taught at Rutgers. Once we moved up to Boston, Mel rented an apartment in Newark where he stayed during the week, and I used to like to visit when he was there over the weekend. Mel lived in Newark when he was a teenager; for me, the city was an acquired taste. At first, I just saw it as a convenient launching point for getting to New York City (which it certainly is). But then I began to really look at the 1940s buildings, the skyline, Ferry Street with its Brazilian and Portuguese culture, and I began to appreciate Newark for its own sake. I was thinking about this today because we are all waiting for the Sopranos to air tonight, and I became a fan of the show the first time I saw the photography of New Jersey in the opening scenes. So I decided that my photo of Newark was worth rescuing. I opened the image in Painter IX and used digital chalk to even out the color of the sky, and then sharpened the edges of some of the buildings, picking up colors that were already there in the original photograph. So I call this a fantasy in Newark, New Jersey, not because of the Sopranos (another New Jersey fantasy), but because the image has been digitally edited. 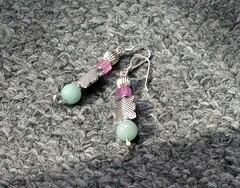 Today I made these earrings. To me, making jewelry is like making miniature sculptures, trying to find the best arrangement of shapes, textures, and colors. Is it spring yet? It was in the sixties today, and the days are getting longer. Tonight Heather stopped by and we walked the dogs in the neighborhood as the sun was getting ready to set. One of the pleasures of warmer weather is walking at sundown. I had forgotten how beautiful that is. 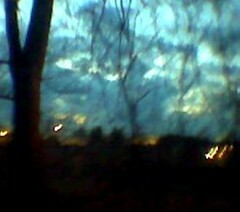 The colors were great, so I decided to try to catch the colors of the sky with my phonecam. Later I cropped the image for the sake of the composition. This is an image taken with my phonecam, but I call it a fantasy not because I was daydreaming at the railroad crossing (although I was), but because the image has been digitally modified. 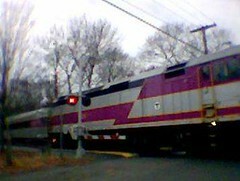 Today, trying to get home after running some errands, I found myself first in line at the railroad crossing just as the commuter rail train from Boston was approaching the station. I love trains, so while I was sitting there, I took out my cellphone and took a picture with my cameraphone. I was interested in the diagonals of the train and the wires in the sky. But when I opened the image in my computer, I was frustrated by an annoying street lamp that interrupted the long line of the train. So I decided to open the image in Painter IX and see what I could do. I did some cutting and pasting, and used some digital pastel and airbrush. Now I like the composition better. 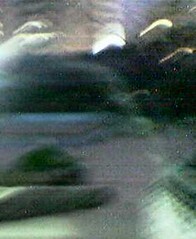 You may think that is a lot of trouble to go to for a tiny image of a fleeting moment. But art makes you look, it makes you notice, and it makes you value the fleeting moments that make up a life. Whenever I hear from friends from Colorado, as I did today, I think about home and those mountains. Tonight I came across this piece of digital art that I produced with my Painter program sometime during the past few years. (I think this might have been done with an earlier version of Painter, but I am not sure.) In any case, what I am sure of is that it is an image of the Colorado mountains, from memory and imagination. Tonight I opened it in Painter IX and cleaned it up a little bit with digital pastel so I could post it here. It seems like I have been working non-stop, rushing from one project to the next. So today, after I mailed off a package, I decided I needed a fifteen minute vacation, so I decided to take a break and stop in at the new Panera's here in Beverly and have a pumpkin muffin (my favorite). 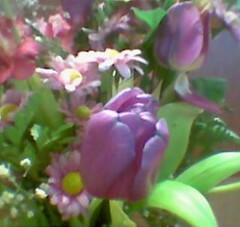 But when I walked in the door, I came face-to-face with this bouquet of spring flowers that were placed right at the entrance. So I stopped in my tracks and just enjoyed them for a minute. It made me smile to think that this was a different sort of break than what I had in mind, a better break, a spring break. So I decided to take a picture with my cameraphone. Later, when I got home (yes, of course, I still ate a pumpkin muffin), I cropped the photo just a tiny bit to bring the tulips closer to the center. Tonight I was looking through my photos and came across this one, a nice memory from the week we spent touring in Scotland two summers ago. I took this photo from the car as we were driving through the Borderlands between England and Scotland, heading west to Stranraer to catch the ferry back to Belfast. The scenery was already amazing, but this view came up suddenly, and just as suddenly I lowered the car window and took the picture. I liked the mill (if that is what it is) and the long row of trees. Tonight I played with the possibility of eliminating the top of the bridge or guard rail that appears at the bottom of the image. 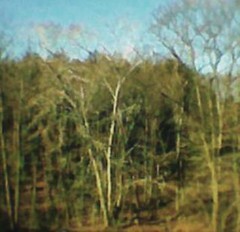 But I decided that the image would lose too much in the transaction, and that the diagonal line at the bottom of the photo worked with the diagonal line of the trees. Also, it helps make it clear that the viewer is looking down on the scene below. I think I would like to use this photo as the basis for a painting sometime. . . The other night, after spending several hours in ballroom dance class, I made this piece of digital art using Painter IX's image hose and pattern pen, making swirls and twirls with the cursor. 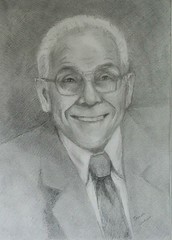 This drawing began as the preliminary sketch for the portrait I painted for my friends. I have been trying to finish up the pencil sketch, too. The most recent changes are opening up the eyes a bit more, and adding some reflected light. I also made some changes to the proportions of the collar and tie. Yesterday Mel called from Korea, where he has been this week. I have never been to Korea, but this is Mel's second trip. Tonight I looked in my photo albums and found the pictures that he took during his first trip there, which was at least ten years ago. I love the look of the Korean street signs in Mel's photos. 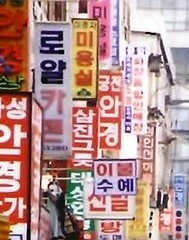 I decided to crop this image out of the background of one of them, focussing only on the Korean street signs to create the effect of a kind of ready-made visual collage. 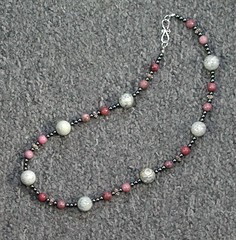 Today I finished up three necklaces made of knotted leather cord with glass beads. This is the one I like the best. Here north of Boston, the temperature has been under thirty degrees for days, and we are due for yet another snow tomorrow. But still, it is the first of March, and spring is inevitable. 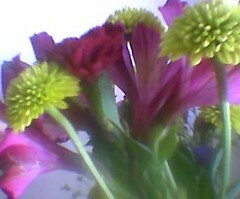 Today at Heather's apartment, I saw these flowers in a vase. 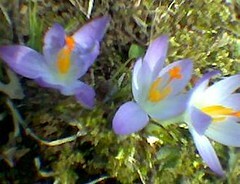 The colors looked like spring to me, so I took a picture with my phonecam. Tonight I cropped the photo just the slightest bit to bring the flowers right to the edge of the image.